It seems like the average age of a marathon runner is getting older. Our analysis of nearly 30,000 entrants in the 2018 Boston Marathon indicates an average age of 42. We ran the numbers on the Top 50 Cities ranked by number of entrants and found some variations. Notably, some Massachusetts cities' runners ages were a few years younger, but at the same time, runners from Tokyo average age 50. 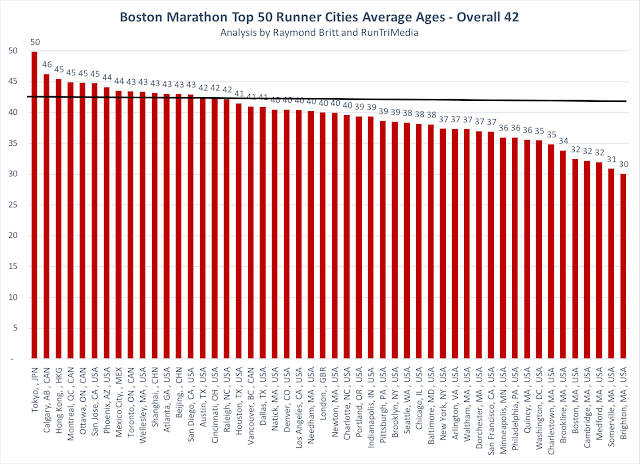 Here's the average data for the top 50 cities based on total number of runners.